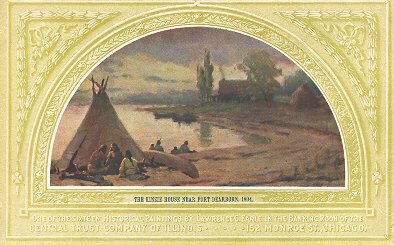 At the mouth of the Arkansas River, Jolliet and Marquette encountered hostile Indians and Spaniards who forced them to return north. 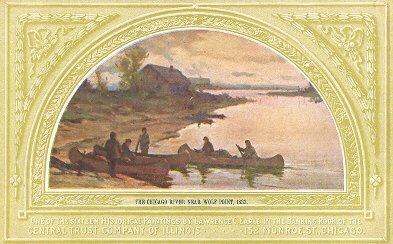 Once, there, the explorers were introduced to the Illinois River route and the portage at Che-cau-gou by which they were able to return to their Mission of St. Xavier at Green Bay. 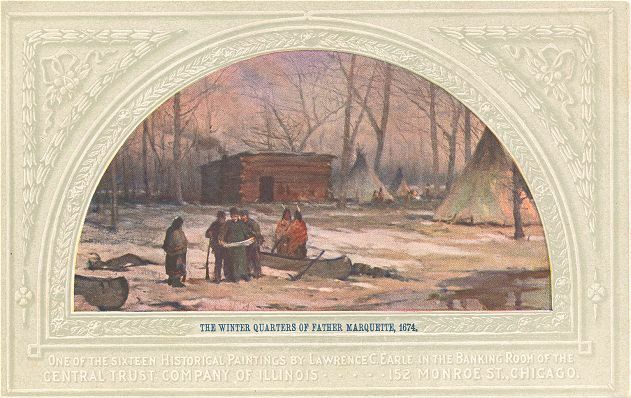 Marquette wintered at that same portage on his second expedition to the area in 1674-1675. 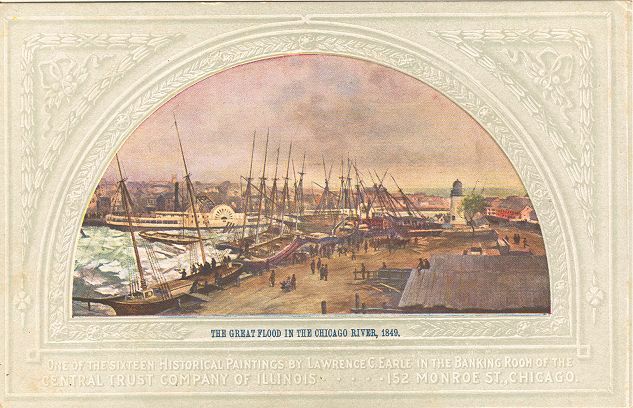 As a part of the 1795 Treaty of Greenville, the U.S. government acquired a parcel of land at the mouth of the Chicago River from Native Americans. Strategically important, the portage area became even more so after the acquisition of the Louisiana Territory in 1803, and in that year Capt. John Whistler arrived in Chicago to build a fort named after Henry Dearborn, President Thomas Jefferson's secretary of war. When Jean Baptiste Point DuSable sold his house and property in the early 1800s, there was a small polyglot community being formed, made up of transient Miami and Potawatomi French-Indian families, the extended Scot-Canadian Kinzie family and a detachment of United States soldiers who came to build Fort Dearborn. This community remained small, numbering no more than 350 in 1833, when Chicago was incorporated as a town. 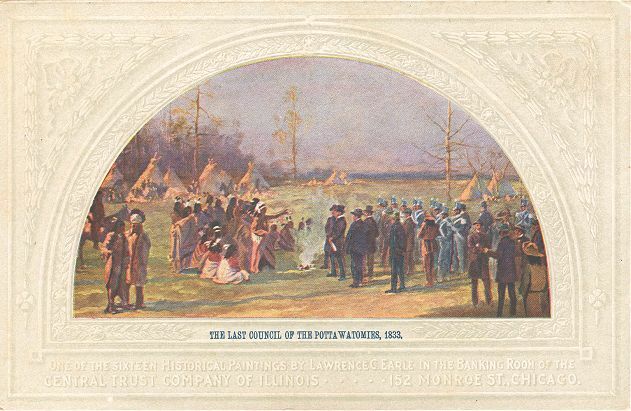 Treaty of 1833 - In late August 1833, more than six thousand Potawatomi, Chippewa, and Ottawa Indians gathered in Chicago to negotiate a treaty ceding their lands west of Lake Michigan to the U.S. government in exchange for a million dollars and western reservations. It commemorates the last and most important Treaty held in Chicago between the Indians and the U.S. Government, resulting in the removal of the Chicago area Indians to the west beyond the Mississippi River. This junction of the north and south branches of the Chicago River was a favored subject for early Chicago artists. In contrast to all other illustrations known, here the view is eastward, not to the north. The building in the foreground is Wolf Point Tavern, with Miller's Tavern across the river. 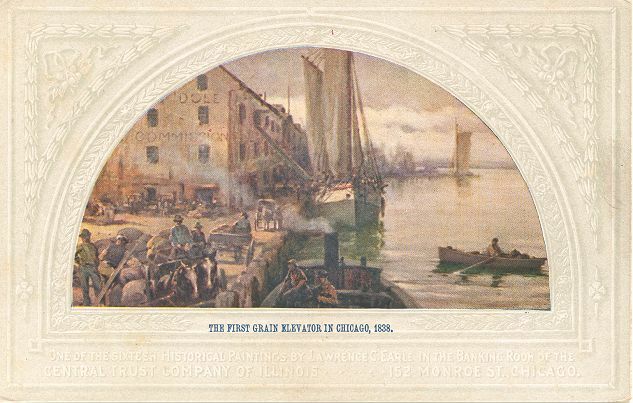 The Grapeline ferry was a privately maintained ferry service across the north branch of the Chicago River prior to 1832, when the first bridge was built; the ferry primarily served patrons of the Wolf Point Tavern. 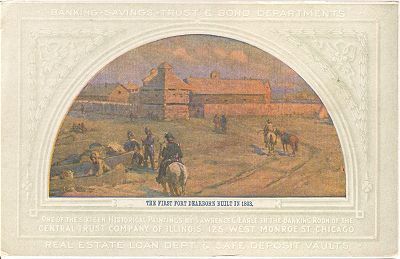 In the year 1835, Chicago, or Fort Dearborn as it was then named, with a population near 500, was growing a bit crowded for some tastes. Anson H. Taylor, a young storekeeper, builder and trader who, along with his brother, had come out from the East, needed more elbow room. Anson and Charles Taylor had built the first bridge across the Chicago River three years earlier, a wooden span connecting the south bank of the river with the Green Bay Trail. 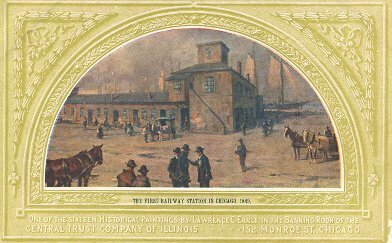 In 1839, the firm of Newberry and Dole began shipping wheat from Chicago's first grain elevator, which was located at the north end of the Rush Street bridge. The wheat was brought from farmers' wagons, and hoisted to an upper story by old-style pulley blocks and rope, by hand power. Steamboats and schooners are bunched up in the Chicago River during the first big flood in the city's history. The first drawbridge had been constructed in 1834, and was torn down in 1839. A new floating bridge was built in 1840, and three more soon followed. All were swept away in an 1849 spring flood, but replacements soon followed. The Chicago, Burlington and Quincy Railroad began operation in the 1840s by running a single passenger car over recycled rails from Aurora to Chicago. However, within the next three years, the railroad was able to expand into the true namesake - extending track through the cities of Chicago, Burlington, Quincy, and Aurora. The CB&Q became well known as one of the finest "granger roads" or a railroad which served agricultural areas, often through smaller branch tracks. In 1849, the Burlington Route staged its last spike ceremony. Before that, they had been operating to whatever the current end of track was. Frink & Walker stagecoach transportation company late in 1834 bought out the stagecoach line between Chicago and Ottawa from Winter, Mills & Co., which in turn had bought out Dr. John T. Temple in February 1834; Temple had pioneered the line earlier. Frink & Walker's Chicago terminal was at the intersection of Dearborn and Lake streets, one of the town's busiest places. 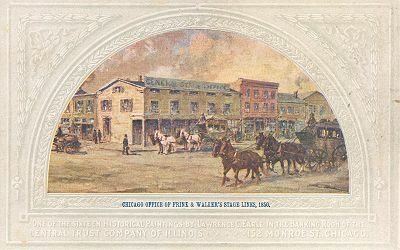 By the early 1840s, years before the first rail lines were pushed west of Chicago, John Frink and Martin O. Walker had already made Chicago the center of a web of stagecoach routes connecting the southwest tip of Lake Michigan with virtually every important economic region of the old Northwest Territory. 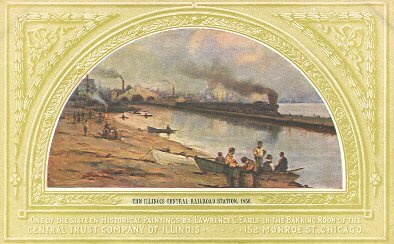 The Illinois Central Railroad was chartered in 1851 to build a railroad from Cairo, Illinois, at the joining of the Ohio and Mississippi rivers, to Galena, in the extreme northwestern corner of the state (the "Old Main"), with a branch from Centralia (named for the railroad) to Chicago. The Federal Land Grant Act signed by Millard Fillmore in late 1850 aided the Illinois Central in becoming the first railroad to receive a land grant. The line was finished in 1856, giving Chicago a route to New Orleans by way of a railroad-operated steamboat line between Cairo and New Orleans. Historically an important part of central Chicago, today the James R. Thompson Center now occupies the block bounded by Randolph, Lake, Clark and LaSalle Streets. It is one of 35 full-size city blocks within Chicago's Loop. Many State of Illinois offices occupy this distinctive building. The Clark/Lake Chicago Transit Authority rail station, one of the busiest in the system, is housed inside the JRTC. Across Clark street is the Chicago Title & Trust Building (Chicago Title Tower) completed in 1992. This used to be the location of the downtown Greyhound Bus Terminal. The Ogden mansion, on the site now occupied by the Newberry Library (Walton Street, between Dearborn and Clark), was saved partly through the timely application of carpets soaked in whatever liquid was at hand. The New England (Congregational) and Unity (Unitarian) Churches, located on the east side of Dearborn and, like the Ogden Home, facing Washington Square Park, were both destroyed. 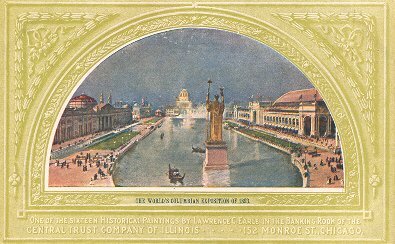 Chicago's Columbian Exposition of 1893 marked the rebirth of the city after the fire of 1871; it was famous for its "White City" that inspired the City Beautiful movement in architecture and city planning. 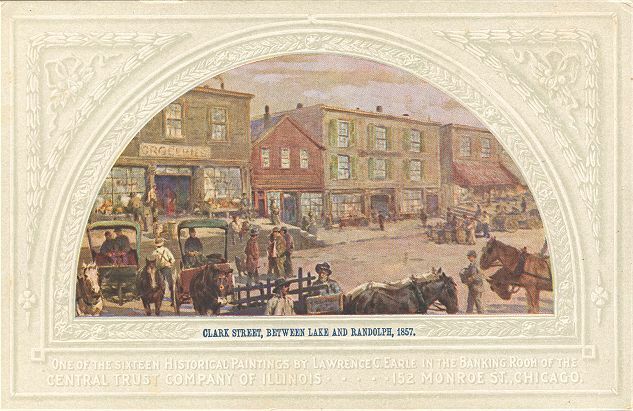 Earle represented the "Great Basin" on what seems to be his most famous of the sixteen murals in the Chicago History series. He also created two large panels for the Manufacturers Building at the exposition. "The Glassblowers" and "Pottery" were large panels placed over the northeast entrance. Flooding of the Des Plaines River overwhelmed the old Chicago Portage and flowed into the Chicago River in 1879 . Members of the Chicago Citizens Council, an association of civic-oriented businessmen, demanded a permanent solution to the City's struggle with sewage by digging a canal deep and wide enough to reverse the flow of the Chicago River. 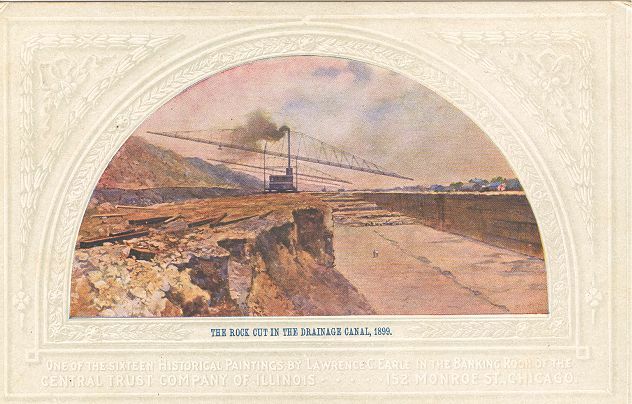 On September 3, 1892 ground was broken for the Chicago Drainage Canal, later renamed the Sanitary and Ship Canal. The new 28 mile canal would run parallel to the old Illinois and Michigan Canal for 28 miles from Chicago to Lockport, Illinois. The new Canal would not have the traditional system of locks, but rather be a continuous waterway, which engineers dubbed "the ditch." Lake Street Bridge spans the South Branch of the Chicago River. 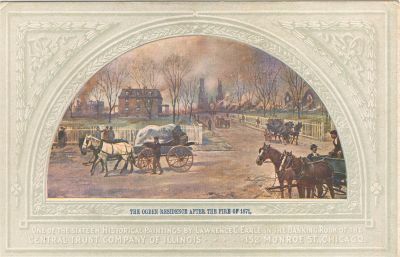 The Randolph Street Bridge (constructed in 1865) and Lake Street Bridge (constructed in 1868) were the two major means of escape to the west from the devastation of the 1871 fire. 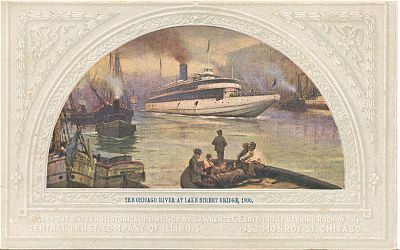 The Lake Street Bridge was said to have been the only one to have survived the fire. It was replaced in 1916 by a drawbridge. Historically, The first Presbyterian services in Chicago were held when Philo Carpenter, a Presbyterian druggist, who was treating the troops at Fort Dearborn for cholera, would gather his friends together on Sundays and read a sermon. He began this practice soon after he arrived in July of 1832. His log cabin drugstore was near the east end of the present Lake Street Bridge.